Millers Jon Taylor. Picture Tony Johnson. Jon Taylor would love to extend his Rotherham stay, but he is not about to go knocking Paul Warne's door down for a new deal. The winger, who was the club's record buy in 2016, is out of contract in the summer, though there is an option of a further year. The Liverpudlian has seen Jamie Proctor and Michael Smith get new contracts in recent weeks and although he would be keen to tie up his long-term future at the AESSEAL New York Stadium he is not prepared to force the issue with Warne. “I'm still in contract to the end of the season and I've got an option as well,” Taylor told the Star. “It's not something I'll be knocking on the gaffer's door about. It's not my place to do that. “I've just got to keep working hard. Then, hopefully, if the gaffer wants to keep me here, we'll have that conversation down the line. Taylor, brought to the club by Alan Stubbs, insists it is the Warne factor that is making life at the Millers so enjoyable. "He's made this place amazing. It's just a great place to be,” he said. “If someone is having a down day, everyone gets behind them. 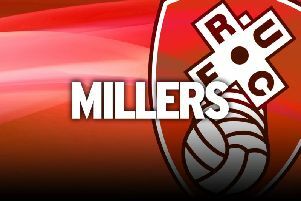 Taylor played 68 minutes as Rotherham doubled their away points tally for the season with a 1-1 draw at Preston on Saturday. Smith finally ended his 1000-plus-minute goalscoring drought with an accomplished finish 10 minutes after the break. It was a deserved goal for the striker who has gone close in recent matches, hitting the woodwork against Bolton and then being denied by a brilliant Darren Randolph save in the 0-0 draw at Middlesbrough. There looked to be more frustration at Deepdale as he saw a first-half effort hit the post, but eventually got his reward after the break and Warne knew it was coming. “Smithy deserved his goal,” he said. “I think he's deserved one the last few weeks. His performances have been outstanding.